Mechanical steam traps operate because of the difference in density between a liquid and gas. The most common types of mechanical steam traps in use today are float & thermostatic and inverted bucket. Thermostatic steam traps operate through a temperature difference between steam and condensate. While steam and condensate can exist at the same saturated temperature, the thermostatic trap takes advantage of the tendency of condensate to rapidly lose temperature when it collects in dead legs off of the main flow path of the steam line. The manner by which these steam traps function determines their best application area and their suitability to a production process. In addition to function, many other factors go into the selection of the right steam trap type, including regional preferences, and even sales and marketing history. One thing factories and businesses should all look for, however, is dependability—something they can get from reputable Mepco steam traps that can be found with reliable companies like ALB Industrial Supplies Inc.
Quality Mepco traps can be expected to perform at optimal capacity while requiring low maintenance. 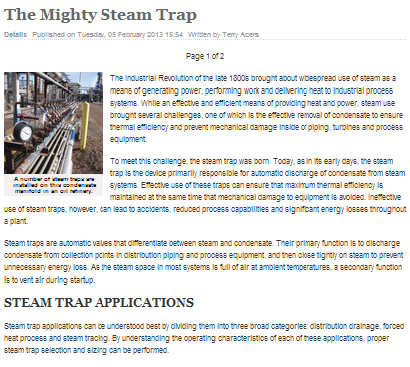 Energy-efficiency is also one of the characteristics of an ideal steam trap. Defective or inefficient units can lead to considerable energy waste not only due to the equipment itself, but also from the effects on the entire steam-generation process. Make sure that if you’re buying from any supplier, determine if their products are genuinely from the manufacturer so you can maximize your company’s efficiency.